Product #3299 | SKU GP-S/12 | 0.0 (no ratings yet) Thanks for your rating! The Switronix GP-S12 is a V-Mount battery adapter. This device allows DV Camcorders operating on 7.2VDC to be powered by 12VDC V-Mount type brick batteries. A 12VDC Power-Tap output is offered for on camera lights. 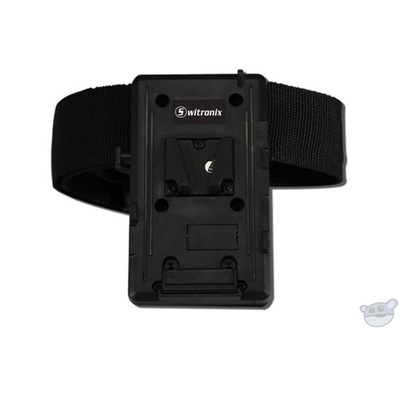 Includes Heavy Duty Nylon Belt with Buckle. This V-Mount adapter was designed to clip to the user's belt for optimum accessibility. The 7.2VDC output will power a variety of DV Camcorders, each brand of camcorder connects to the adapter via a specific cable. This exclusive feature allows a camera mounted light, wireless microphone, or other DC accessory to be powered from the V-Mount battery.